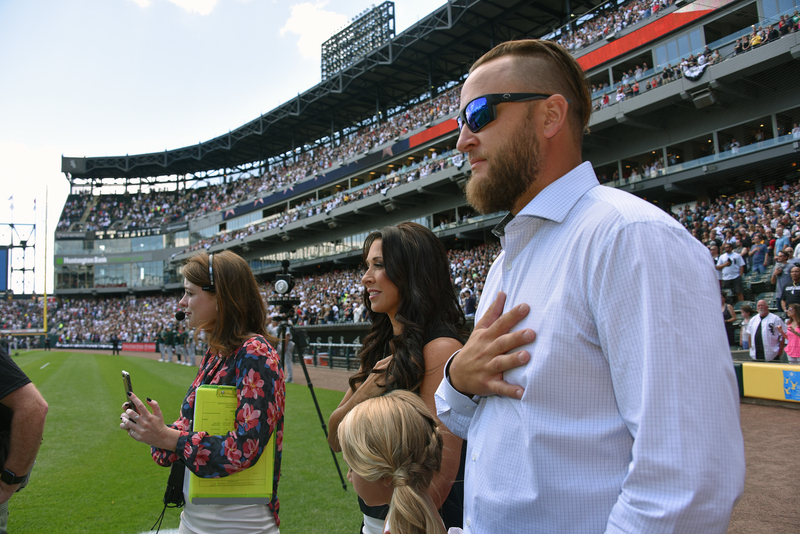 His hand over his heart, Mark Buehrle watches his son Braden sing the National Anthem in Chicago at the former White Sox player’s jersey retirement. Images from June 24, 2017 at Guaranteed Rate Field in Chicago during Mark Buehrle Day, on the occasion of the former player’s No. 56 jersey retirement in Chicago. 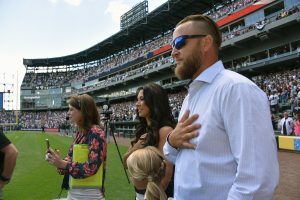 His right hand over his heart, Mark Buehrle watched his son Braden sing the National Anthem in Chicago on June 24 as the former Chicago White Sox pitcher saw his No. 56 jersey retired. 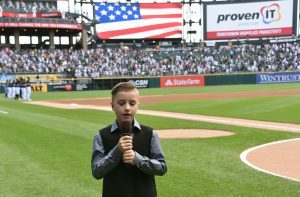 He also got to catch the first pitch before the game, tossed by his daughter Brooklyn on a 76-degree blue sky Saturday afternoon at Guaranteed Rate Field before the Sox game against the Oakland A’s. Buehrle’s wife Jamie was also on the field during this family memory maker. 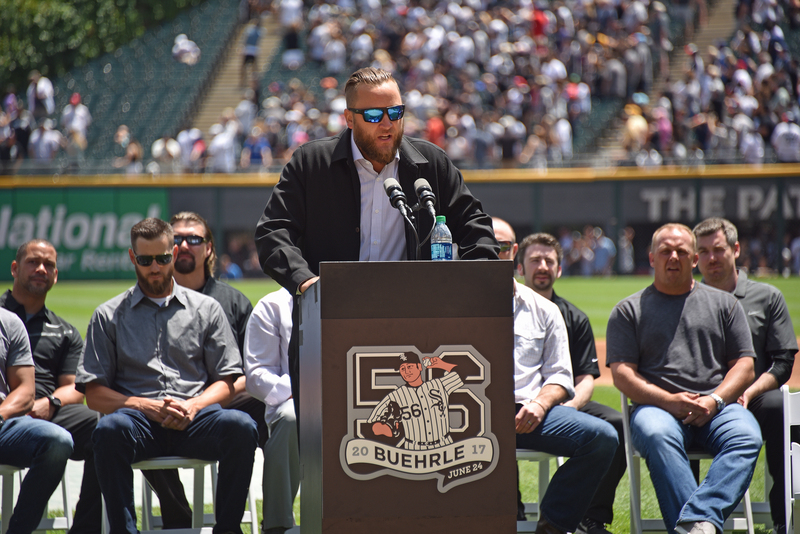 “It’s an amazing feeling,” Buehrle said, after the ceremony. 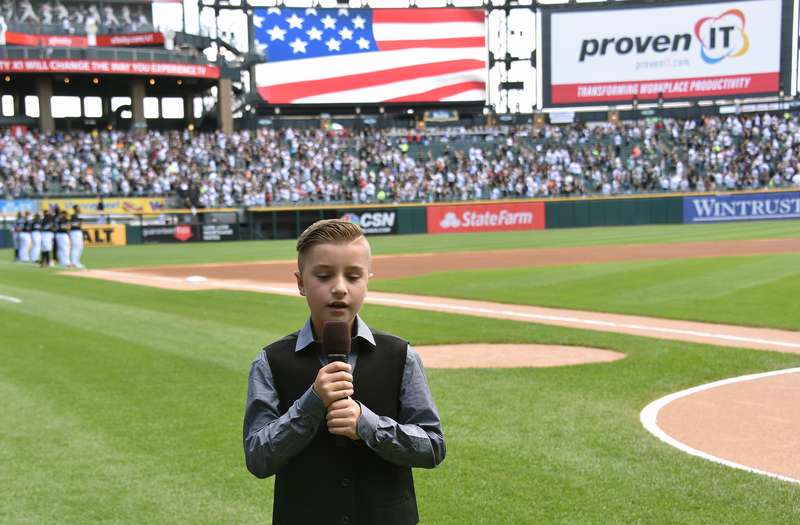 Mark Buehrle’s son Braden sings the National Anthem in Chicago at his father Mark Buehrle’s White Sox number retirement. Images from June 24, 2017 at Guaranteed Rate Field in Chicago during Mark Buehrle Day, on the occasion of the former player’s No. 56 jersey retirement in Chicago. Of seeing his children complete their assignments on the field with confidence: “It was awesome,” their father said. 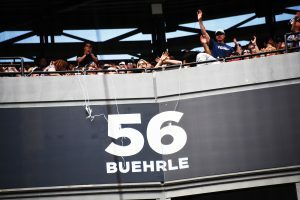 Buehrle became the 11th player in White Sox history to have his number retired before a standing room only crowd. Former White Sox manager Ozzie Guillen was among Major League Baseball celebrities on the field. The left-handed Buehrle is one of the only pitchers in MLB history to throw a no-hitter and a perfect game during a career. Buehrle also recorded the save in game three of the 2005 World Series, a championship won by the Chicago White Sox. In addition, he was a five-time All-Star during his career and was the winning pitcher of the 2005 MLB All-Star game. Buehrle joins former teammates Frank Thomas and Paul Konerko as players from the 2005 White Sox championship team to have their numbers retired. 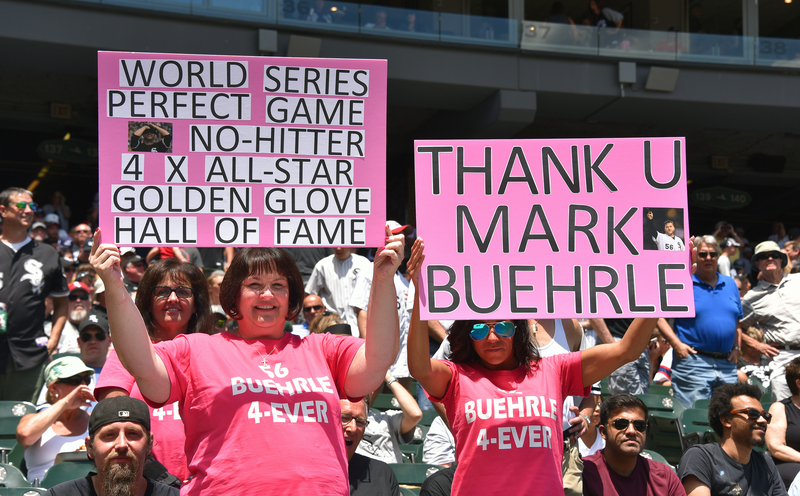 Mark Buehrle’s jersey retirement has just been unveiled. Images from June 24, 2017 at Guaranteed Rate Field in Chicago during Mark Buehrle Day, on the occasion of the former player’s No. 56 jersey retirement in Chicago. One of Buehrle’s most famous plays for White Sox fans was on opening day of 2010 in Chicago against the Cleveland Indians. Buerhle flipped the ball from in between his legs to a bare-handed Konerko to get the out at first base. 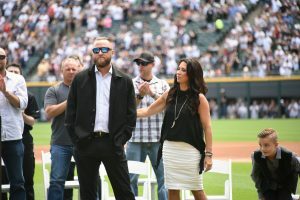 During the ceremony, Buehrle received two White Sox colored vehicles as a gift, an ATV and a truck. He also received custom baseball-themed artwork. 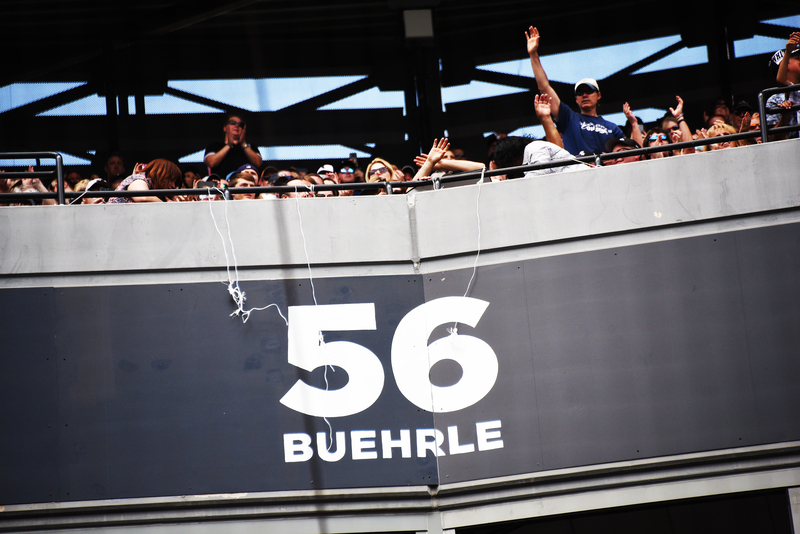 Outside of the park, Buehrle and his family unveiled a marker featuring his retired number. Fans say Buehrle is one of the greatest defensive pitchers in recent history for compiling four Gold Gloves, the award given annually to the best defensive player at each position. 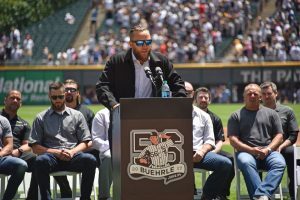 “It’s Mark Buehrle Day, baby!” said an enthusiastic Dion Ursino of Park Ridge, a fan in the stands who began clapping as he talked before the ceremony. Ursino brought his World Series baseballs from 2005 and hoped Buehrle would sign them. Why not? Either way, Ursino offered good wishes to Mark Buehrle and his family. “Just thank you, and enjoy today, celebrate,” Ursino said.